Are You a Woman of Hope? Home > Are You a Woman of Hope? It’s more than a sprinkle. More than a splash from folded hands clapping against the water. More than a squirt of pool water sprayed between wiggly teeth. The feeling I’m describing is more like swiveling off a concrete edge. Tippy toes curl over a cracked surface unsure of where they are going. Fingers twiddle, knees bend, and eyes focus on drifting water. Suddenly, a crisp breeze pushes ripples across a watery reflection of a hopeful woman who slowly disappears. Images of hope and promise swirl in a blur as she becomes immersed in dense waters of disappointment. We can dog-paddle to the only source of hope we know. Jesus, Jesus, Jesus ~the only ledge of hope worth reaching for. It seems harmless to sputter off the words, “I am disappointed,” but the reality is words like these provide fresh water to seedlings of discouragement waiting to sprout beneath the surface. Seeds of disappointment will ultimately shoot forth with buds of depression, discouragement, and despair. This will distract us from our faith…causing us to be focused on self rather than on God. Have you ever known someone who said they were disappointed and then a few months later they were completely depressed? Their seed of disappointed grew into stalks of despair. Their spiritual growth stunted because of something that began as a simple distraction. How do we stop the cycle? We Discipline Ourselves. We can stop disappointment in its tracks by disciplining ourselves to stop, pause, and pray. We pray, pray, pray for the power of the Holy Spirit to get us through something we cannot do in our own strength. It’s difficult. It’s a pull up your sleeves and dig in your heels kind of work. We become a woman who places her trust, her confidence, and her hope firmly in the sovereignty of an Almighty God. A woman who’s willing to release her plans so she is available to receive his plans. Placing our hope in Jesus is what motivates us to cling to him when tumultuous waters rise. We cling, we grab, and we reach for Jesus as if He were the only life vest on a sinking ship. Whatever, whenever, however, we just get to him and we hold on for dear life. 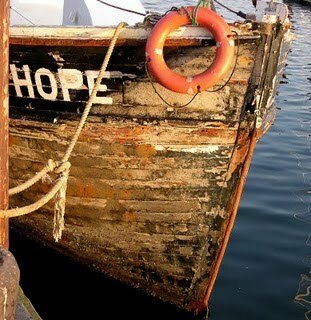 Remember hope floats; disappointment sinks. When you begin sinking, will you reach for Him? Previous Post Is There a Hole in Your Soul?